If the salmon is to be the model of how one should be living life and expending energy, it will not be a surprise to see that there is something in the nature of this fish that isn’t quite natural. For a significant moment of time in its life cycle, the salmon doesn’t move with the current that it is in but rather swims against it. It goes upstream against gravity, often navigating around obstacles like rocks and boulders, escaping from the clutches of predators like bears and birds of prey to finally reach the very spot where they were born. This does make this animal an oddity. Here, the female salmon will lay her eggs and the male salmon will guard the fertilized eggs, and after expending so much of themselves in this process, worn out and starving, the parents of the fertilized eggs end up dead. As their bodies decompose, they provide nutrients for the next generation. After a period of about 4 months, the salmon eggs hatch, and the young fish remain in the fresh water river before heading into the salty seawater, where the incredible cycle repeats itself. There is definitely something that is almost noble in its life cycle, and something that we can learn from this strange nature of this fish. At its peak time of its life, it has the need to go against the current, to expend itself, and to give of itself so that the community and next generation can live and grow find its strong echoes in the emotional and spiritual quest for maturity in our human lives. The narrative of the times keeps masses of people drifting along the current of popular thinking. While the phrase used to describe what is popular and trendy is synonymous with what is ‘current’, a ‘current’ is also used to describe what pulls one along in its wake. The Christian call to authentic human living and loving in ways that are specifically Christ-like in orientation are most definitely not current. In fact, many of the truly Christ-like tenets of life like the call to honesty, chastity, selflessness, unconditional forgiveness, altruism, charity and other-centeredness are so counter-cultural that there seems to be a great reticence in preachers speaking strongly about these largely because the average listener will find it so hard to accept these as the values that a Christian disciple are called to uphold and to live by. To survive as a Christian requires one to be constantly mindful of the hard task of authentic Christian living. 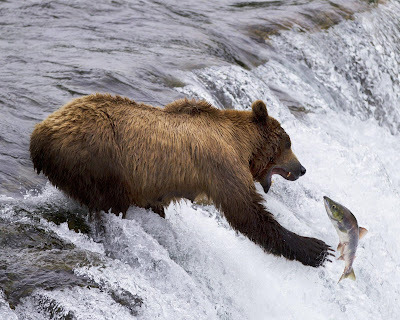 It is, to use the salmon analogy, to nurture inside each one of us a certain willingness to swim against the current that so many others are being swept by. And as the salmon swims from the salt water sea through the brackish waters and finally into the fresh water streams, it is actually locating through some sort of inbuilt homing device which biologists have associated with their sense of smell, their place of birth – where their lives originally started. Isn’t this too our common search in life? The paths that we find ourselves meandering through in life, from the unchartered open waters of the sea of life where so much is alluring and delightfully distracting at the same time, to the calmer lives of midlife where the waters more insipid and the tastes of life are less exhilarating. Brackish water, which is where seawater and fresh water mix give us this experience. And when we finally are ready for giving ourselves over to what has given us our deepest selves we give over not our lives but our deaths to the next generation in faith that they too can feed off our entire life energies and hopes. I have received numerous comments that oftentimes, my reflections on life are a tad idealistic and that it is very hard to live with a life that is always indicative of our awareness of our deepest calling to authenticity and grounded character. I would be remiss if I do not stress the need for living the authentic Christian life with moral courage, especially if I am using such a medium such as a weekly blog, a platform that is open to many but taken seriously by few. Much as each week’s topic stretches my mind in all directions, I also bear the hope that each reader who drops by and follows my thoughts also does the same to his or her way of living out the life of Christ, where there is a constant need to stretch the heart to love in ways that are beyond mere sentiments and to live for more than just the self. Make no mistake - these are also very real challenges for me, both as a priest and as a human being. Strangely, they have become clearer to me ever since I have had the second wind in life after my life-saving stem cell transplant, and I do find myself writing and speaking about this with renewed ardor, zeal and with a veracity that is backed with a certain energy. I also do know that this is a tremendous grace given me by God for a purpose. My compassion and charity also makes me bear in mind that it is not possible for us to be bringing our A game to life all the time. What’s the A game? It’s that peak performance that all sportsmen and women train to attain, where their muscles are at their most conditioned, and where their bodies have reached the pinnacle of their strength. Coaches know that this “A game” state is not one that is maintained for a long period, and so they have to work with the cycles of the bodies of their protégés to be able to attain this peak state of their talents to coincide with the sporting competitions when they will pit their strengths and skills with other fellow sportsmen in the same field. Every athlete or sportsperson who has won a gold medal at any of the games of the Olympiad would know that they had brought their A game on the day they won the medal. Much as it may seem to allude, but our spiritual lives is not a game. It is far more than just a game. It is a matter of life and death. How we live in this life determines very much how we live in the next. Who we live for and whose precepts and creed we live by are strong indicators of how we give our deaths over when we die. Our A game in our spiritual lives are not for a mere moment, but a never-ending call to want to die trying. Jesus gave his entire life for our eternal hope and the call to live with a Christian character that embodies Christ’s very life is the grace-energy that each baptized person responds to from within. Having Christ as our chief model in life to pattern after, is the only energy that we can effectively rely on to want to give ourselves over in this selfless and generative way. A salmon may swim upstream with an inbuilt instinct, but Christians, we know why we are counter-cultural. That call to emotional and spiritual maturity is always going to be an uphill climb. But for us, it is far more than a mere instinct. It is our deepest selves calling us to authenticity that defies logic. It is our Christ-selves calling us from within. Perhaps this explains why regimes and despots who ruled by might always felt insecure by the presence of Christians who knew where real power and lasting strength really came from. Are we responding well to this call to emotional and spiritual maturity as a disciple and follower of our Lord Jesus Christ? May this week see us bringing our Christian A game to every sphere of our lives. Your analogy of the life of a salmon is quite apt. It seems to me that, the more one tries to follow Jesus, the more one is at odds with this ‘world’. For to (try and) live as an authentic Catholic is frankly, to swim against the tide (and it is a very strong tide). But the upshot of all this (daily) struggle is this: we become stronger. On the other hand, to ‘go with the flow’ and just drift downstream is to become progressively weaker; to the point that we might just forget how to swim - or at least keep our head above water. What a terrible position to be in! But (I believe) if we have a genuine desire to follow Jesus, and ask for the grace to persevere in faith, He will provide. All we have to do is ask. God bless you, Fr. Luke. Following Robbie J, we need good shepherds to plant the desire in us and so frLuke, i pray that you will continue to swim against the tide of these "reticence preachers" and continue in speaking and writing the Truth of the Good News. Until i realized eternal live is forever, no end, i lived like a fool. And i thank Jesus for the soft prompting and for shepherds like you. I was mulling over the Gospel reading (Mat 23:23-26) where Jesus seems to delight in the use of hyperboles. The image of the gnat and the camel never fails to bring a smile to my lips. His humorous and witty but spot-on takes on the hypocrisy and affectations of the scribes and Pharisees never fail to leave them livid with impotent rage. Here Jesus was warning the religious leaders and teachers about their hypocrisy and their need to examine their hearts for purity and honesty of intentions. He was alerting them to their spiritual immaturity. Maturity does not happen automatically. It is very hard work and even the learned and clever are not spared. When one is apparently satisfied with the basic teachings of God and the Church, there is a tendency for one to be complacent, to be “spiritually lazy”- feeling that one has arrived – just like the scribes and Pharisees! But this is the very danger one should be looking out for. For it is a myth to think that maturity has a ceiling and one can reach it. I feel that it is an on-going process of growth and this can be painful, as - this ceiling keeps receding as one advances, ending only when one takes the last breath. I also believe that maturity comes with the courage to really live authentic lives (as you have said). Authentic - as in being true and honest with oneself and in one’s dealings and relationships with others whilst adhering closely to the teachings of one’s faith. 300 - looking back with gratitude.